We all dream about that perfect night’s sleep. It can be frustrating when you feel like you can’t shut your mind off and wake up feeling groggy. If that sounds like you, look no further than this simple DIY Vetiver Pillow Spray. Vetiver is an excellent essential oil to help you get a good night’s rest and wake up feeling energized the next morning. Not only is it a go-to oil to help calm the mind before bedtime, but it also is prized for its earthy, woodsy, smoky scent that is pleasant to the senses. Spray this mixture on your pillow before bedtime to help calm your mind and get a refreshing night’s sleep. Please note, because the Everclear acts a preservative, this has a shelf life of 3-6 months. Mix water and Everclear in 2 oz bottle. I made this pillow spray over the weekend and I love it. Very easy to make. Was wondering if anyone used this recipe to make a perfume spray – tweaked with oils of choice. I love Vetiver on a cotton pad under my pillow at night. Can’t wait to try this pillow mist. PT you are amazing. Thank you! I’ve been wanting to make a pillow spray with Vanilla Oleoresin. Could I sub it in for the EOs here? Also, am I understanding correctly that witch hazel is not a good substitute for the Everclear or Vodka? I’ve seen mixed thoughts on that. I have used lavender for pillow spray for years. Thanks for the recipe! I will have to make it next time I run out. 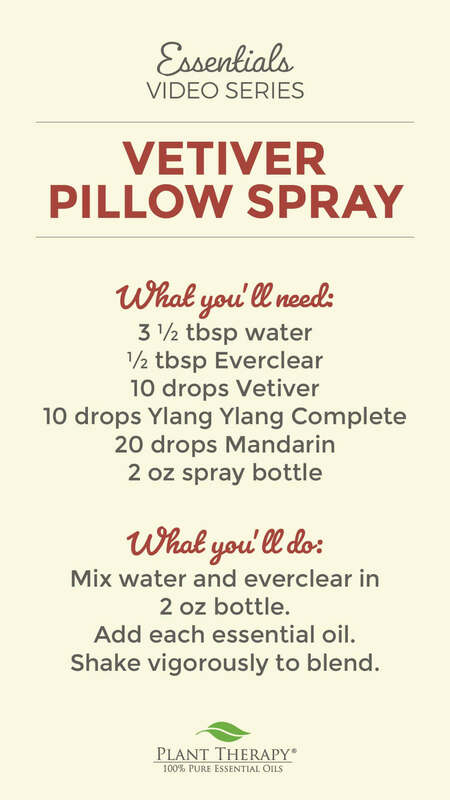 I love diffusing vetiver blends but never thought to make pillow spray. Now I know what I will be making while my kids are at school. This sounds nice! I’ve got vetiver and I love the way it smells but for some reason none the oil recipes I use regularly call for it. I’m glad to find a fun use for it! If we didn’t add the everclear as a preservative, how long is the shelf life? 6 months is still really short isn’t It? What is Everclear. I’m familiar with all the essential oils. I am a big DIYer. Love making pillow sprays and using Vetiver for nighttime. My 10yo uses Vetiver and Lavender in a roller several nights a week to calm his mind at bedtime. I can’t wait to try the pillow spray subbing the Ylang Ylang to make it kid safe of course. I’ve made this for all the members of my family… Each person has their own bottle in their room… And everyone is still so impressed that it works and gives them a fantastic night sleep!! Thank you from the bottom of this Mama’s heart!! I love this combo so much and find it so relaxing for sleep that after reading they are both great for the skin I am making a nighttime facial serum with this combo. Thanks for sharing PT! Quick question, before I can make this. If I couldn’t purchase alcohol or would prefer not to because of religious beliefs, what could I substitute the everclear with? Vetiver is my absolute favorite oil! This is the best stuff! I cannot wait to make this pillow spray. Thanks! Thanks PT. This pillow spray is awesome. I made it substituting orange for the Mandarin. A few sprays on my pillows before bed, and I am asleep minutes after l get settled. I used the everclear 151 proof and the oils don’t blend with the water, so I just shake it well before each use. I would try the ever clear 190 proof next time. To answer Robin’s question about staining, I have not noticed any stains so far. I love this pillow spray! Vetiver has the most styling power of all the oils in this spray, so I would probably go a little lighter next time. I never thought about using a pillow spray. This is a wonderful recipe and idea! Definitely not a silly question! Everclear is a specific brand of alcohol that is a neutral liquor and has a very high proof (120-190). If they don’t have anything similar in Australia, you can substitute vodka. Just look for the highest proof available. This may be a silly questions, but my dogs sleep with me. Is this safe for them to be around? I made this and love it! I spray it on my pillow and some sheets every night. It’s great! Over time I have been slowly replacing other brand EOs with PT brand and have been happy with each replacement. I have been putting off ylang ylang because I have so much left of another brand that I feel it would be wasteful – especially if I end up having to send it back. But, this blend sounds so great & I have been thinking of a new pillow spray – I may have to take the plunge. I do not like mandarin, but it could work in this blend. Thanks for the great recipe! Need to try this! Vetiver is on my next cart! Trying a kid safe version of it with Lavandin. I just got Vetiver and I will defenitly be trying this out, thanks so much! I love the smell of vetiver and use it nightly in a roller ball diluted with a carrier oil on the back of my neck, wrists, and the bottom of my feet. I can’t wait to try the pillow spray. Vetiver has been one of my favorites to use for a good night sleep. I love vetiver and use it nightly diluted with a carrier oil in a roller ball. I never thought of a pillow pillow spray . Thanks for the recipe. I love the smell of vetiver and am excited to try this spray. I love the diy blogs- they are so helpful! This pillow spray is awesome! I subbed lavandin for ylang ylang to make it kid safe. Awesome! My son keeps it by his bed. That is a great idea for a substitute to make it kidsafe! Oh! I have all of these oils! I am totally making this tonight! This is a great recipe, I have used lavender in place of ylang ylang which also makes a nice blend. I made this using Grey Goose vodka, ylang ylang and orange along with the other exact ingredients. I have sprayed my boyfriend’s pillow every night. It seems to work! He is sleeping and seems more focused. When this batch is gone, I will make more. The scent seems to sweeten/improve through the week. I LOVE Vetiver and tolerate Ylang Ylang, but with the Mandarin, I think this will actually be perfect. I can’t wait to try it! What could I substitute for the Ylang Ylang for a husband that barely tolerates to the smell of Vetiver as is? He prefers citrusy scents and I often add Vanilla Oleoresin to blends so that he find the scent more pleasing. It sounds like you have a pretty good idea already about what to substitute the Ylang Ylang for. Any citrus will help soften the aroma of Vetiver, but stick with Orange (Sweet or Blood) and Mandarin as they are very soothing. If he enjoys Vanilla Oleoresin you can absolutely try to add that in, too. If you come up with a blend that you love, we hope you share it with us! It looks like my vetiver is floating on top of the alcohol water mixture. I added additional Alcohol, however it still does not stay in solution. Am I doing something wrong? Also, I want to give some to a friend, but I am concerned it might stain due to the color of the vetiver. Does anyone knoe if this is an issue? I am curious about the staining too. I am thinking about making this Pillow Spray but am wondering if it will stain. Anyone know? It’s hard to find Evercleafr in Hong Kong. Is replacing it with rubbing alcohol ok? You can substitute vodka for the everclear. Just be sure to use the highest proof you can get. I will try this but leave out the Vetiver as it makes me a little too drowsy in the morning. This pillow spray sounds great. I will have to give it a try. I wonder how it would be if I used Patchouli instead of Ylang Ylang. Patchouli is a relaxing scent but not as overpowering as Ylang Ylang. I might try it both ways and see which I like better. I will definitely try it, sounds wonderful. I’m wondering if Everclear is still needed if I used distilled water? I also see the video says to store in the fridge or add preservative, but the post says the etoh is a preservative? I have had Vetiver in my wishlist since Christmas. After watching this video and reading all the comments, its definitely going on my next order. Night of sleep, here I come. Will this stain? I’m concerned about the color of the vetiver. I made it and it seems to not want to stay in solution. The vetiver forms a layer on top of the water/etoh mix. Should it be separating? Barb, 100 proof vodka, cheapest brand works just fine. Everclear can be hard to find. This sounds amazing! Would orange be a good substitute for Mandarin? Yes, I have the same question as some of the others….what is Everclear? Where do I get it? I didn’t know you had to add a preservative to DIY cleaning products made with water. Is ever clear good for all sorts of DIY products? Thank you, this sounds great! Do you have a kid safe alternative to ylang ylang? What can you substitute for the everclear? What can be a substitute for Everclear? I have Polysorbate. Would that do? is orange sweet a good sub for mandarin? I made this after seeing it on the live. Retha wasn’t joking this smells amazing. Can you let me know what I could use to make this kid safe? My 3 year old is a terrible sleeper and I’d love to make something to help her so that we both get more sleep. Hayley, you would need to replace the Ylang Ylang in this recipe to make all the oils KidSafe…there are many other floral oils you can use instead, like Jasmine, Palmarosa, Geranium, Chamomile, or Neroli. Ooh. I have all these oils and am always looking for great sleep/night time blends. Thank you PT. Hmmm…it’s been quite some time since I’ve bought Everclear. Hmmm….I might use Vetiver, Ho Wood, and spearmint and make the spray. This has been one of my fave diffuser blends for bedtime. Pillow spray might be perfect! Wondering what to use instead of everclear? Vodka, witch hazel, or rubbing alcohol?? If you wanted to use a different alcohol such as vodka or rubbing alcohol what would the alcohol content or proof need to be? Oh this is perfect timing, trouble with sleeping from the full moon approaching so I wanted to make a bed spray. And love vetuver! I can’t wait to get my vetiver so I can try this. Thanks for sharing. Vetiver is my #1 night time oil, I’m very excited to try this pillow spray!! Would lavendin be a good substitute for ylang ylang? I absolutely love Vetiver for sleep. Can’t wait to try this pillow spray. Would love to make but i dont have everclear..I would hate to have to go out and buy a bottle just for this when I only need a half a teaspoon. Is there any other alcohol that can be used was wondering about the vodka. Vetiver is a favorite of mine to aid 8n sleep. I’m going to try this one for sure! Where do you find everclear? Liquor store?? I tried looking it up, but there’s conflicting information on whether or not it’s illegal in my state. Is there something else you can use instead? You should find Ever Clear in the liquor store. It is also known as grain alcohol, I would suggest you could substitute vodka if you can not find it. Yes, Everclear is a liquor. It is usually used for making a party punch. I’ve seen recipes like this using distilled water instead of alcohol, it’s just that it doesn’t dry as fast on your pillow and the shelf life is shortened. Rubbing alcohol might be a good alternative but I’m not sure. Same for Witch Hazel, plus I’m not sure how that would affect the scent. Kacie, in Virginia you can only buy Everclear with a permit. I use 151 rum in my DIYs. You won’t smell the rum and it works beautifully. Hope this helps. Can I substitute vodka for the everclear? Everything I’ve read indicates that I high proof vodka is a good substitute. Yes, vodka would be a good substitute as far as I know, because it also has no added scent and dries fast. I LOVE vetiver! This is going to be a must for me soon! I may need to try this! I think I’ll decrease the amounts of ylang ylang as I find it very strong and not my favorite. But I do like diffusing it with Vetiver. I have been wanting to try making a spray but was hesitant to get a preservative. This looks super easy, so I am excited to give it a try! Thank you so much for the suggestion on a good night spray. Just the reason I needed to order Mandarin! This is really making me want to purchase some vetiver! I would love to know a good substitute for ylang ylang too so it is only using kidsafe oils.